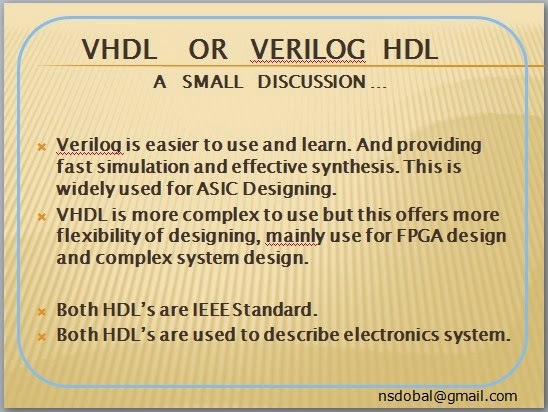 VHDL or Verilog HDL - A small discussion (VHDL with Naresh Singh Dobal learning Series). Verilog HDL is easier to understand and use, It is very effectively used for simulation and synthesis. but it lacks for system level or complex designing. It is promoted by OVI (Open Verilog International). It is widely used for ASIC designing or lower level design (RTL or lower), but this results in faster simulation and effective synthesis. Mostly used in North America, Asia & Japan, but not popular in Europe. Both the HDL's are used to describe electronic systems. The function of systems is to get input data from it's environment and give output some data in return. In verilog HDL this is called a module which is a basic building block in Verilog HDL, and in VHDL this is defined in Entity & Architecture Pair. Both the Languages are IEEE Standard. is any basics need to learn for knowing VHDL Language. I basically use VHDL, as I have found it to be quite easier than Verilog. I have tried learning Verilog but it just doesn't fit on my mind, seems too complex when compared to VHDL. I mainly use VHDL for all my designs, but it would be nice to learn about Verilog. Is there any book easy to read and understand for beginners wanting to learn Verilog?